To commemorate the passing of the great Amiri Baraka, we bring you an insider’s perspective on what it was like to work with such a towering cultural and literary icon. From 2002-2011, Kalicia Pivirotto worked as an Associate Editor at UC Press, where she assisted Baraka on the publication of his collection of writings on music, Digging: The Afro-American Soul of American Classical Music. I held photos from his personal collection in my hands. It felt illicit, like ripping out a page from a library book. Except it was my job to sort the photos, correctly label and tag the art program for use in Digging. It posed a bit of a conundrum. 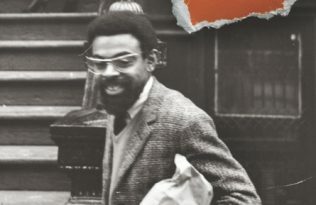 Amiri Baraka! The man! Tremendous respect and reverence. Made me want to freak out, in the best and most festive sense of the word, like a teenager at a Beatles concert, British Invasion-style. Appropriate? Not so much. Pull it together, girl. These are important conversations we have with ourselves. How do I demonstrate respect, appreciation – no, proper understanding of the magnitude, context within history, poetry? And not come off crazy, sycophantic, a nuisance? It’s not about you, it’s about him – that’s how. This is the pulling it together part. Early in my tenure at UC Press I spoke briefly with the artist Shirin Neshat, who had agreed to provide something (art? A blurb?) for a book I was working on. I may have gushed a little. I regretted it – not because she wasn’t gracious, but because it introduced a dynamic: the fan. You need a barrier from the fan. The expectations. The feeling that the fan knows you – personally – through your work. What do we want, fans? I think we want recognition, appreciation – for our good taste, at very least. When do we want it? Now! It’s a lot to ask when you think about it. I did think about it. Regardless of the impact his work had on my own poetics, I didn’t want to alienate with over-eagerness again, however genuine my admiration. In other words, I filtered. Kept the crazy in. I think it made a difference. When we spoke on the phone (Amiri Baraka calling meeeeeeee! ), I aimed to be as supportive and professional as with any author I worked with. I hope the approach engendered ease, a sense that I was a trustworthy guide through the tortuous, exacting hoops of scholarly publishing. My reward: he called back. He let me help. Here’s the thing about authors, especially renowned authors: they don’t do this part, typically. If they’re established, there’s an assistant or prize grad student taking care of details. Word count, formatting, permissions, art placement, who’s got time? Amiri Baraka did, apparently. So it wasn’t just the photos, the manuscript. It was his voice. He was soft-spoken, which surprised me, mighty as his voice is in his work. He wanted to get it right, and he spent time to follow it through. I remember wondering if he were always so calm and unpretentious – would a diva materialize if something didn’t go smoothly? No book is without snags when you get down to the technicalities – was it just a matter of time? An expression comes to mind: “judge the art, not the man.” Why? Because the art is transcendent, but the man is a jerk. Not so with Baraka. He was unfailingly even, unassuming, focused. It was calming, elevating even. Of course I didn’t know him in any real sense of the word – a few phone calls, email exchanges – but impressions are made from experience, however limited, and he left a pretty great one. The coolest, to let the fan have her say – not in grand gestures or statements, but in character. To have a hero, and have the hero live up to the ideal. It’s illuminating, even after the light has gone out. Kalicia Pivirotto is a poet with day job in San Francisco. She received a MFA from Saint Mary’s College of California in 2003, and holds BA’s in Italian and English from San Francisco State University. She has been published in 26, Five Fingers Review, Transfer Magazine, and received an honorable mention in the 18th Annual National Writers Union Competition judged by Adrienne Rich.